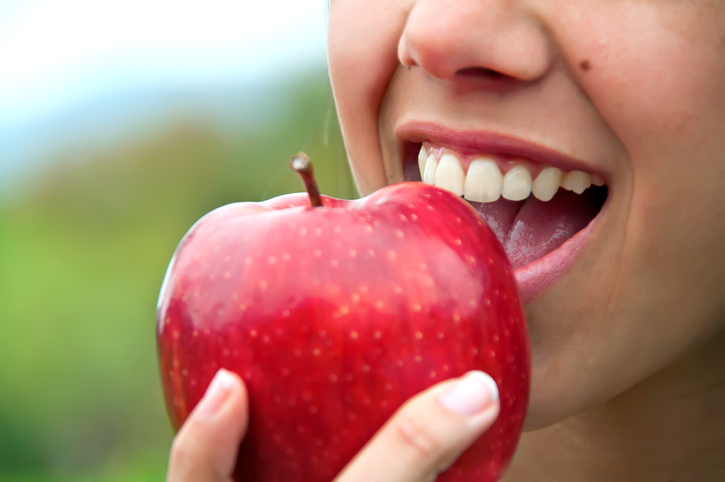 A woman biting an apple. If you bite something, it means that you cut something with your teeth, usually because you want to eat it. He bit the apple and his tooth fell out. If you bite something, it can also mean that you take something between your teeth, sometimes because you want to hurt someone. The cat only bit her because it was scared. A bite is a small piece of food that you have in your mouth. Every bite of that meal was delicious! Bobbing for apples is a game that children (and adults!) play at Halloween. To play this game, you put apples in some water, and then you have to take them out. You can’t use your hands so you have to bite the apples with your teeth. It’s not very easy! Watch this video to learn more about how to play. There are other meanings of bite.